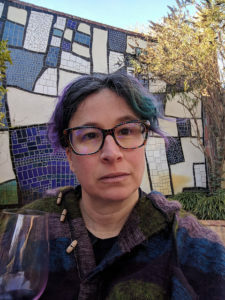 Today I voyaged to Richmond BART! It was very exciting! 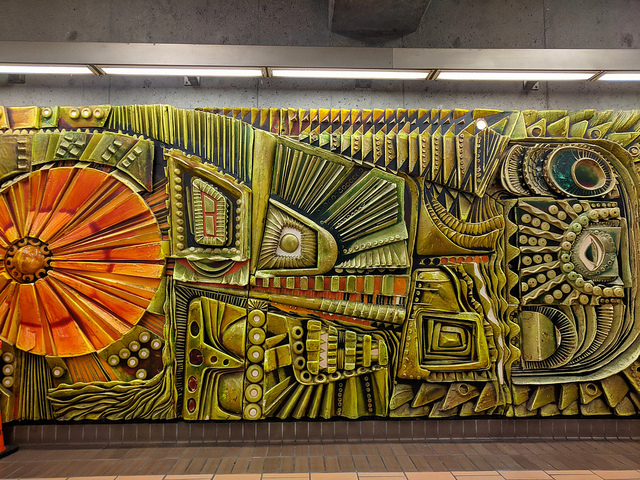 A giant mural/sculpture by our old friend, William Mitchell, is in the concourse level. It’s bright greeny-blue and reddish orange, wild and glistening. It is supposed to evoke underwater sea life and also something Aztec, but it also made me think of shell mounds and of a giant lizard. You can get right up to it and feel its smooth, weird shapes. Long sloping ramps and an elevator in a large distinctive red structure at the station’s east entrance. A bit like the prow of a ship. Orange California Poppies blooming in the sun. To the east there were several little Mexican/Central American markets. You are not going to find a coffee shop or a latte within a couple miles of here but you can get good groceries. It reminded me of neighborhoods I grew up in, in Detroit. Downtown is half a mile to the east, an easy scoot or walk. The Civic Center, which includes an auditorium, is big, spacious, deserted looking at 2pm, and very red-bricky; the library is pleasant. I browsed their shelves and found a good collection of Native American history and literature books. (Research for Transitory.) Lots that isn’t in the SFPL system. There is an elevator to the 2nd floor, to get to it, you have to get the nice librarians to let you behind their circulation desk. 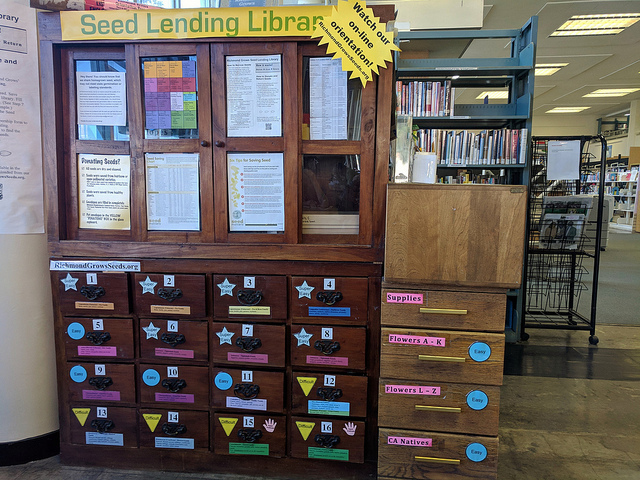 And their Seed Lending Library is very good! I took a Cupcake Papaver somniferum poppy packet and some Golden Sweet Pea that has pretty flowers that you can eat. Best use of little card catalogue style drawers… intriguing to open and riffle through. I have some seeds in envelopes that I could bring to donate next time. ON the west side of the station there is an interesting nook or two, one with a terraced hanging garden and the other with a bench underneath three big murals of the history of Richmond, On the Right Track by Daniel Galvez and Jos Sances. I liked the murals themselves and underneath each one there was a bas relief sculpture of different trains throughout the region’s history including a Pullman car, one carrying the Bay Hippo, a car carrying a ship or a submarine, a fruit and veggie car, a car with a mariachi band and a jazz band, and finally an Amtrak and a BART car! It’s so adorable! I wish it were lower down so it would be easier for people to see all the details. Check this out, the west entrance of the station. Looks like a spaceport doesn’t it? To the west of the station, looked like a public housing project but a pretty nice one. Like, they tried to make it nice to be in. There were places to sit and this is also where you’ll find the convenience store most handy to the train station. There are some small colorful decorations along the walkway down Nevin street, iron railings kind of like the papel picado railings around the 16th and Mission BART stairwells. I didn’t go much further but sat and ate some chips in the sun. There was a big transit center here as well with very good maps showing places you could go on various buses. I was tempted to take the 72 bus to the Richmond Ferry (which in the library, I learned was the former Ellis Landing, built amidst huge Huchiun shellmounds. Next time maybe. Need to go back to that library and also try to make it to the Richmond Plunge and Wildcat Canyon. ON the trip home I also would have liked to visit El Cerrito but the El Cerrito del Norte elevator is out until April 1. 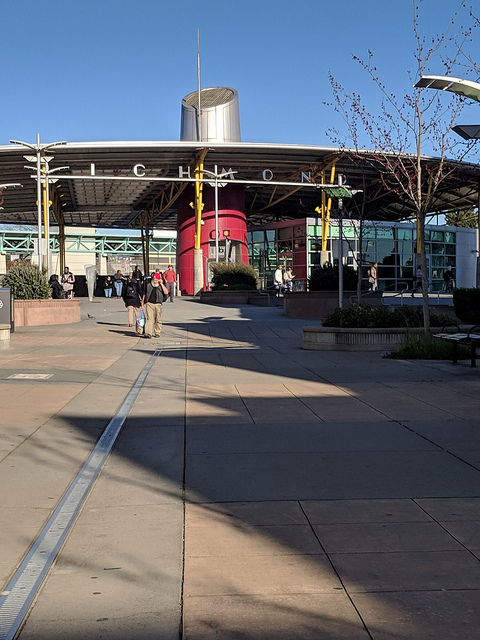 I was warned by several people that there is “nothing” to see in El Cerrito but I have my eye on the Ohlone Greenway and the wildflower park in the middle of it. Richmond – home of some of the country’s cleanest fuels, lubricating oils, and juicy steak-making propane. Richmond, home of the most cringeworthy, tone-deaf, awkwardly phrased and most-containing-food-where-it-shouldn’t-be corporate slogans!